Lack of detectable lymph flow in developing mesenteric lymphatics of Clec2–/– mice. (A–F) Clec2–/– mice exhibit edema in the intestine wall after E15.5. H&E staining of cross sections of embryonic intestine is shown at E15.5, E16.5, and E18.5. Scale bars: 100 μm. (G and H) LEC elongation in P1 mesenteric lymphatics was measured by staining for PROX1 (green) and VE-cadherin (red). Yellow lines indicate representative measurements of cell length and width. Scale bars: 50 μm. (I) Quantitation of intestine wall thickness. n = 2 mice per timepoint for each genotype and 2 sections per mouse with at least 3 wall thickness measurements per section. (J) Quantitation of LEC elongation using length/width ratio. n = 4 animals at E15.5 and 5 animals at P1 per genotype. Over 100 LECs were measured per mouse. All values are means ± SEM. *P < 0.05, ***P < 0.001. P value calculated by Student’s t test. (K–N) Oral lymphangiogram 2 hours after neonatal ingestion of Bodipy-FL C16. White arrows indicate lymphatic vessels in the mesentery. Images are representative of 5 mice per genotype. 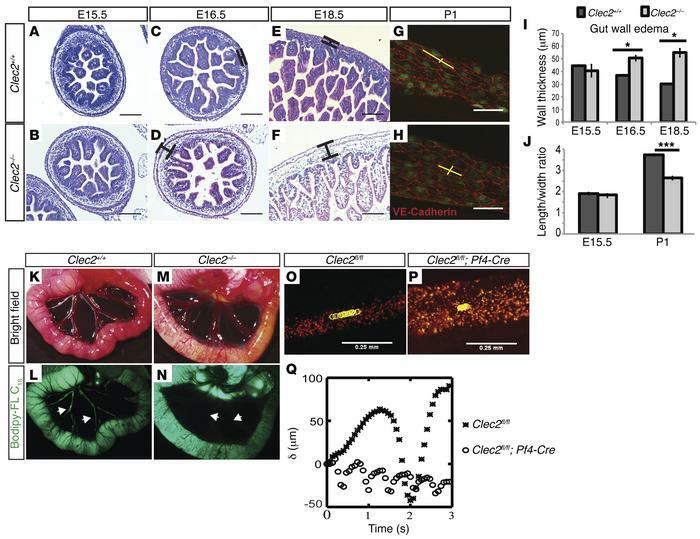 (O and P) In vivo measurement of lymphatic flow by bead tracking in surviving 4-week-old in Clec2fl/fl vs. Clec2fl/fl; Pf4-Cre mice with blood-filled lymphatic phenotype. Yellow circles indicate position of bead in each frame of video over one contraction cycle. (Q) Quantitation of bead displacement (μm) over time relative to starting point in Clec2fl/fl (black asterisks) vs. Clec2fl/fl; Pf4-Cre (white circles). Representative images shown from bead tracking in 3 mice per genotype.